Claire O’Dell’s 2018 A Study in Honor is a near-future Holmesian mystery. Public spirit compelled Dr. Janet Watson to serve on the Federal side of the New Civil War1. After an enemy bullet cost her an arm, the government thanked her for her service by providing her with a second-hand, defective prosthetic limb and a medical discharge. She has broken up with her girlfriend. She is having a hard time finding a job (not that many jobs for one-armed African-American surgeons). She is depressed and struggling with PTSD. Nevertheless, she persists. Watson settles for a position well below her skill level, as a medical technician whose tasks are limited to ticking boxes on a checklist. Now she has to find a place to live in the crowded capital (a quest complicated, of course, by the melanin content of her skin). Watson’s housing issues are solved in an unexpected way. Sara Holmes (occupation classified, probably spy) wants to share her luxurious apartment with a roommate. The rent is suspiciously low; Holmes is pushy. Indeed, Holmes has never met a boundary she didn’t want to push. Still, life with a nosy, pushy spy is preferable to life in a dirty, crowded tenement. Work provides a distraction. A veteran’s unexpected death inspires Watson to dig further. Her curiosity is noted. In short order, fraudulent complaints about her work are inserted into her official record. Watson is summarily fired. Not only that … it soon becomes clear that her life is in danger. Geniuses like Holmes often have difficulty conforming to social norms. This is partly due to their efforts to avoid terminal boredom and partly due to their success in getting away with wacky hijinks (intelligence pays). This leads to more wacky hijinks, like stealing roommate diaries. In the abstract, such follies are not in the best interests of Watson. In this case, Holmes feels possessive of Watson and Holmes will do her best to keep Watson alive. Which is great, I guess, until Holmes tires of Watson. SF is always of its time. 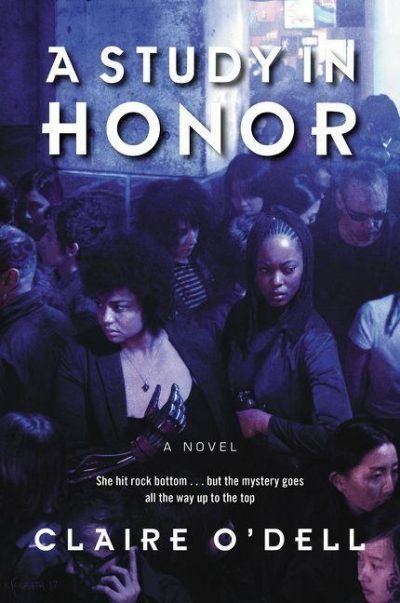 That said, Honor could be emblazoned with WRITTEN IN A FURY SOMETIME AFTER THE ELECTION OF DONALD TRUMP. Written in a rage at the resurgence of ignorance, racism and misogyny, to name but a few characteristics of the current administration. This book has been pitched as a dystopia and I suppose it is — but it’s a louder 2016 disguised as 2028. Same vices, dialed up slightly, But not all of them. America 2028 seems to be missing today’s concentration camps. Which just goes to show that reality is always worse than one can imagine. I assume there will be sequels to this skillfully written book. The Kavanaugh hearings and whatever horror show follows them should inflame the author sufficiently that the sequel pages will tend to combust with a clear blue flame. A Study in Honor is available here (Amazon) and here (Chapters-Indigo). 1: Presumably the New American Civil War to anyone living outside the US. Well, "Second Holmes" is taken. And therefore, inaccurate. Most pastiches amount to "What if Sherlock Holmes was alive today?" Although "What if Sherlock Holmes was alive in the 22nd century" has been done as well - as a cartoon series, with approximately that title. The BBC's "Sherlock" has Holmes and Watson having to insist to everyone that they're not a couple; "Elementary", with a female Watson, may be by now? The 22nd century Watson is a robot with the canonical works installed as personality database. "The Return of the World's Greatest Detective" had Larry Hagman, a trademark issue possibly, and Joan Watson played by Jenny O'Hara. So again the game is afoot, or is that a description of the original John Watson's war wound? There has been zero UST between Holmes and Watson on "Elementary". Their relationship is that of siblings, not lovers. According to Goodreads "The Janet Watson Chronicles"
The doubled paragraph is fixed but I don't understand why it keeps happening. Usually that kind of thing is a pasting error produced when you move a paragraph but click twice. "The Kavanaugh hearings and whatever horror show follows them should inflame the author sufficiently that the sequel pages will tend to combust with a clear blue flame." I suspect, now, more like thermonuclear plasma. As I understand it, the basic plot was written well before the 2016 election. Some revisions were added afterward, but mostly it was intended to be an alternate timeline, not our present one. How kind history is to authors, every once in a while. Truth be told, I wish history had proved me wrong.